Community Cats Coalition was formed in 2001 by a group of dedicated caring volunteers who have devoted their time, expertise and own finances to help stray, feral and abandoned cats. We are dedicated to representing, unifying, educating and providing help to hundreds of residents of Worcester County who call us every day regarding stray cats and kittens on their farms and in their neighborhoods. We are a “coalition” of animal control agencies, vets, rescue groups & adoption quarantee organizations working together to increase awareness through education of the public to the benefits of trap/neuter/return & to end the killing of healthy & treatable shelter cats countrywide. As a result, a “No Kill Nation” will only be achieved when shelters and animal control agencies fully & comprehensively implement the program & services of the “No Kill Nation” equation. But when shelter directors & heads of animal control agencies refuse to do so willingly, we must force them to do so, or force them aside. Our Mission is to save the lives of homeless cats by providing access to low cost spay/neuter surgery in a safe and humane environment, collaborating with others and mentoring like-minded organizations to increase spay/neuter in their regions. Our Vision is a community in which people value the lives of cats and ensure they are healthy and safe, cared for, & have access to food, water, shelter and medical treatment. 1. Feral cats and kittens have a right to live and to be humanely treated and cared for. 2. Provide managed long-term quality care in conjunction with trapping, neutering and return to home site for adult cats. (TNR) is the accepted and the best available method to control the feral cat population. 3. Adult cats that are in jeopardy and the home site is not safe or available, must be relocated to appropriate places or sanctuaries. 4. Kittens are taken from their colonies to continue their lives in adoptive homes. 5. 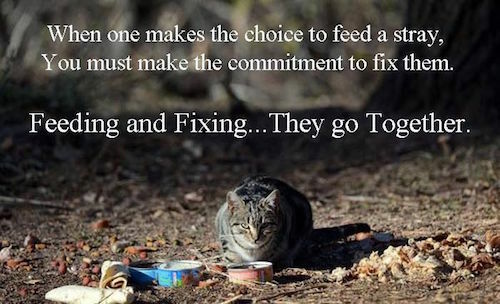 Implement solutions for the immediate and ongoing needs in supporting feral cat colonies. Maintaining the stability of the colonies is very important to our program. We need to be a reliable source of food & care for the cats. This is key to the health of our colonies. The healthier the cats, the better for the whole community. 6. Long-term quality care in conjunction with trapping, neutering, and returning adult cats to their home site (TNR) where appropriate is the best available method to control the community cat population. 7. Education is key in creating and maintaining healthy communities. 8. A problem in the community requires the entire community to come together and be part of the solution. 9. Protecting animals in suffering is EVERYONE”S responsibility.